Due date: End of course (date TBD). In this fourth and final assignment you defy the laws of physics and perform numerical magic by controlling smoke to match target keyframes of your choosing. The approach we will take is based on the SIGGRAPH 2004 paper by [Fattal and Lischinski 2004]; Graphbib page; ACM Digital Library link (with SIGGRAPH presentation). Your implementation should run interactively for several nontrivial examples. Starter Code (cs567.smoke): This project has significant Java starter code, primarily to support smoke simulation based on [Stam 1999; Fedkiw et al. 2001], OpenGL rendering and a skeleton code for smoke control to get you started. It is available here, with online Javadoc documentation here. In this assignment, you will modify this package as needed and however you like. Things you might want to tinker with are simulation parameters, mouse/keyboard controls, exception handling for neural input device, etc. 'e' : Export frames toggle. FluidSolver: This class is the basic fluid solver based on [Stam 1999; Fedkiw et al. 2001] and is a modified version of this "Stable Fluids" applet by Alexander McKenzie (Caltech Multi-Res Modeling Group), which is similar to Stam's GDC03 C implementation here. This basic solver will get you off on your way to controlling smoke, but it's not ideal. Although the MAC grid is preferrable numerically, a simple easy-to-understand grid definition is used in which all values (velocity, pressure, density) are defined at the same grid point--see this illustration. This should make your coding slightly easier. Constants: Useful constants including grid resolution, and forcing parameters are gathered in Constants for your tweaking convenience. Test Images: A variety of test images are included in the "code/images" subdirectory. Add your own images! You will be able to easily use any image loadable via the ImageIO library, and they will be automatically sized, resampled to the resolution specified in Constants, and converted to grayscale. Performance Profiling: In addition to timing your broad and narrow phase collision times, you can use the "java -Xprof ..." option to help identify and remove program bottlenecks (currently used in r.bat). Driving force: Modify the skeleton code in SmokeKeyframe and SmokeControlForces.getDrivingForce(...) to implement the driving force term. First, since the ratio of the gradient of the blurred goal density to the blurred goal density, or (GRAD rhoGoalBlur)/rhoGoalBlur, does not change over time, you can compute it once and for all in the constructor of the SmokeKeyframe--fill in this code. Second, wire in the force in SmokeControlForces.getDrivingForce(...). The driving force amplitude is controlled by Constants.V_f. The drag or damping force, Constants.V_d * u, is already implemented for you in FluidSolver.velocitySolver(). Gathering force: Implement the smoke gathering force in SmokeControlForces.getGatheringRate(...) using the discretization discussed in class, i.e., evaluate the effective diffusion coefficient and gradients on cell edges, then evaluate the divergence of the flux (=diffusion coeff * gradient) at the cell center using the edge-based values. Visualization: Instead of drawing the density field, try drawing other fields using a keyboard control. Drawing the smoke control forces will help you understand what your many parameters, such as blurring, are actually doing. Smoke preservation: You'll notice that due to numerical dissipation the smoke tends to decay over time, and therefore it can not match keyframes. This was one of the motivations for the particular CFD solver used in [Fattal and Lischinski 2004] but something you'll have to make the best of. Mass preservation was also discussed in [Treuille et al. 2003]. Experiment with different normalization schemes that help match the overall keyframe density norm. Be careful not to change the normal too quickly or it may introduce artifacts, e.g., when changing keyframes. Also simple scaling of the density field can produce other artifacts... see what you can do to make it work. Stability: By this point you should notice that the simulator is not always stable due to the explicit integration of smoke control forces, and associated time-step restriction. Also, reducing the smoke diffusion rate, Constants.SMOKE_DIFFUSION, to zero can lead to artifacts. Experiment with stability for different time steps, grid resolutions, and various parameter settings to understand how to make your simulation more robust. Preconditioned Conjugate Gradients (PCG) solver: One of bottlenecks and numerical deficiencies of the starter code is that Gauss-Seidel relaxation is used to solve the linear systems in FluidSolver.linearSolver(...). This solver is used for both the pressure Poisson equation solve, as well as to diffuse velocity or smoke density if there are nonzero viscosity or smoke diffusion coefficients, respectively. Use your previous PCG implementation along with a suitable preconditioner to make the simulation faster and better. There are many possible preconditioners including Jacobi, Gauss-Seidel, incomplete LU (ILU), modified incomplete Cholesky (MIC), multigrid, etc. You might also use an FFT-based solver if you are willing to convert the problem to use periodic boundary conditions (see the JGT article [Stam 2001]). For example, this piece code on Robert Bridson's page implements MIC. The simplest choice is probably a Gauss-Seidel relaxation--which you already have! Boundary conditions need special care in your linear system solver. The starter code approximates a Neumann BC with the normal derivative of pressure zero at the boundary. 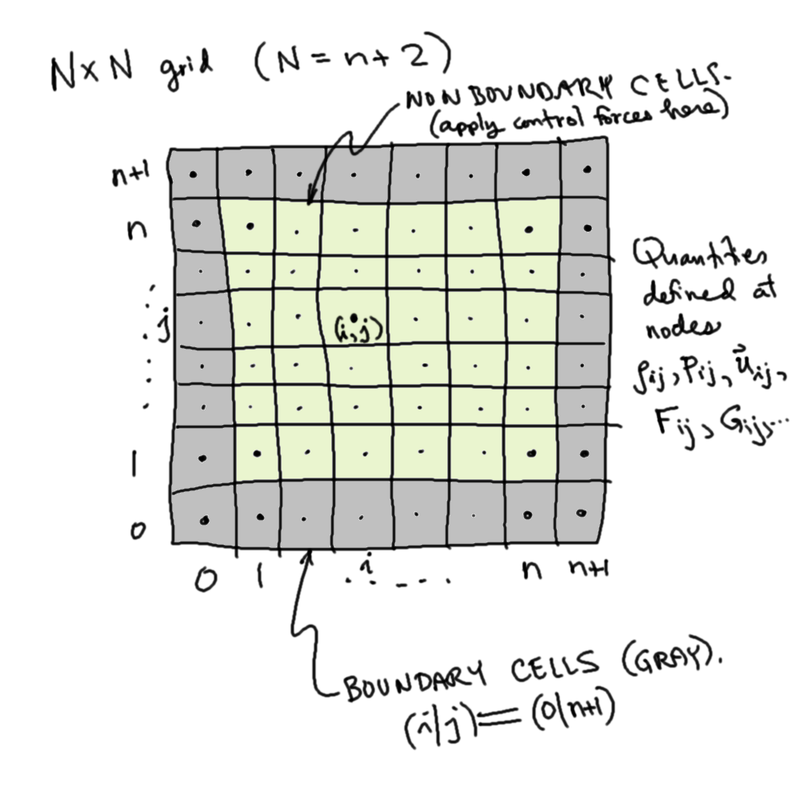 Implement Neumann BCs correctly in your solver. Blur implementation bottleneck: Another serious bottleneck of the skeleton implementation is that the Gaussian blur (in Blur) is approximated using iterative local-averaging, and is currently O(N^3) for an N-by-N image and O(N) kernel radius. Although heavy blurring is not required, the support of the effective blurring kernel (Gaussian) must be large to avoid division by zero, and to produce meaningful driving forces. Implement something better (such as an FFT blur operator) to eliminate this bottleneck. 3D Extension: Given a working 2D implementation, it's only a little more work to convert the smoke solver to a full 3D implementation, e.g., replace I(i,j) with I(i,j,k), etc. See if you can blow smoke into the shape of a 3D solid model, or make a ship sail through a smoke ring. MAC grids are better than uniform grids, so give them a try. Improved advection: Try implementing the improved advection with filtered cubic interpolation from [Fedkiw et al. 2001] and see if that improves the quality of your smoke. Implement [Fattal and Lischinski 2004]: If you're more ambitious, go ahead and implement the CFD solver described in the original paper, and see how much it improves the quality of your animations. Internal boundaries can be introduced with some modifications to your pressure solver, and can let you model more interesting domains. Rigid objects can also be introduced into the fluid with a modified linear solver, and some coupling forces. Some related graphics papers you may find useful are [Carlson et al. 2004], [Baxter and Lin 2004], and [Guendelman et al. 2005]. Multiple smoke fields and colors can be introduced as in [Fattal and Lischinski 2004]. Alternately, see if you can have smoke fields of RGB colors that can transition between colors to match colored images. Fluid control: See if you can control dyes in fluids with free surfaces similar to smoke. Better still, try to control the shape of the fluid surface using control forces. You can try implementing the FLIP scheme of [Zhu and Bridson 2005] (consider this starter code). Improved rendering: Consider a ray-marching scheme (such as in [Fedkiw et al. 2001]) for improved smoke rendering. Something else! Feel free to talk to me about any other ideas you have. One Creative Smoke-Control Artifact! : One of the best parts of computer animation is creative use of mathematics and computer programming. Create! Use your imagination to create something really interesting. Modify the starter code in any way you want. Suggestion: Build a movie renderer: Load in a movie image stack (using lazy loading) and use them as keyframes. See if you can generate a class to render movies in smoke! Include videos of your work, and also please include one still image that represents your most interesting scenario. Hand-in using CMS: Please submit a short write-up (detailing what you did, your findings, and who you discussed the assignment with, etc. ), as well as your Java implementation, a creative simulation artifact(s), and videos of anything you want me to see, etc. J. Stam. Stable Fluids. In SIGGRAPH 99 Conference Proceedings, Annual Conference Series , pages 121-128, August 1999. N. Foster and D. Metaxes. Modeling the Motion of a Hot, Turbulent Gas. In SIGGRAPH 97 Conference Proceedings, Annual Conference Series , pages 181-188, August 1997. J. Stam, A Simple Fluid Solver based on the FFT. In Journal of Graphics Tools, Volume 6, Number 2, pages 43-52, 2001. J. Stam, Real-Time Fluid Dynamics for Games. Proceedings of the Game Developer Conference, March 2003. R. Fedkiw, J. Stam, and H. W. Jensen. Visual Simulation of Smoke. In SIGGRAPH 2001 Conference Proceedings, Annual Conference Series , pages 15-22, August 2001. Copyright Doug James, April 2007.